Malt Mileage has been extremely lucky to secure cognacs comprising the DEAU Cognac range, including the DEAU VS, VSOP, Napoléon, XO, Black and Louis Memory. In this post Malt Mileage reviews the DEAU Louis Memory. Cognac Louis Memory is made from grapes grown in the much revered Grande Champagne region of Cognac in France, the oldest of which were harvested at the beginning of the 20th century and the youngest were harvested in the 1970’s according to DEAU. That makes the youngest cognacs in the bottle at least 35 years old and the oldest around 100 years old or a little more. Perhaps the most striking quality of the DEAU Louis Memory in my tasting of it was how well its flavours matched a good quality cigar. On hitting the tongue, the cognac was fruity with waves of soothing vanilla creaminess and this washed away the aftertaste of the cigar, and with the palate refreshed the cognac began to emit bright shades of eucalyptus and mint amidst the fruity undertones as a nuttiness began to emerge towards the finish with hints of umami. It was that flicker of umami on my taste buds that signaled I was ready for another puff of the cigar, and with that puff the remaining nutty and umami notes from the cognac accentuated beautifully the smooth tobacco smoke of the Romeo y Julieta No 1 Cuban cigar. 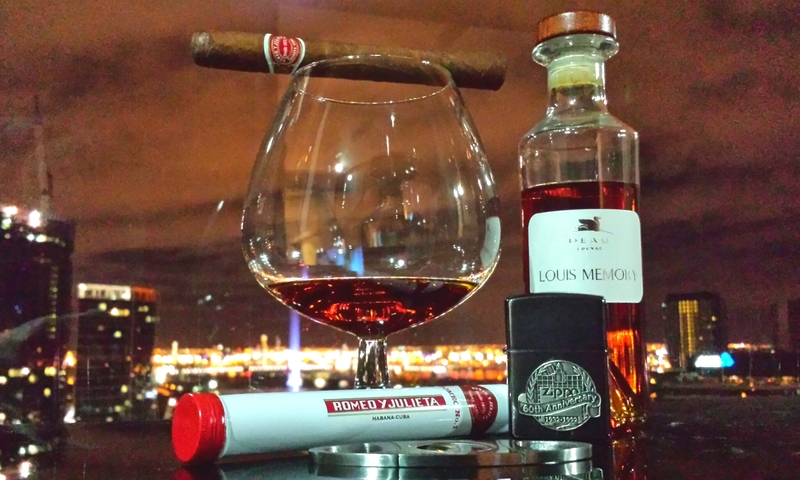 The DEAU Louis Memory struck me as a cognac that is – whether I am right or wrong – designed for cigars in mind because the shades of rancio evident in its flavour profile cleared the palate up to mid-palate but towards the finish the emerging nuttiness and umami notes accentuated the proceeding puffs of the cigar. The bouquet is quite fragrant, fruity and floral with notes of lavender, menthol, licorice, cigar tobacco, coconut, red candy, ripe peach, perfumed soap and hints of ground coffee with undertones of peanut satay. On the palate shades of rancio shine brightly – fruit, waves of soothing vanilla creaminess and hints of earthy mushroom and soy sauce emerge on the entry, then brightening eucalyptus and menthol notes emerge at mid-palate only to fade into the finish, gradually replaced by a nuttiness and umami character. This entry was posted in Cognac and tagged alcohol, Brandy, cigar, Cognac, DEAU, France, Louis Memory. Bookmark the permalink.